"Chocolate, nuts, brown sugar, bourbon...no special occasion needed for this decadent dessert. It's a family favorite and so easy. Serve with lightly-sweetened whipped cream, dairy whipped topping, or vanilla ice cream and warmed chocolate syrup." Beat eggs in a large mixing bowl with an electric mixer on high speed until eggs are foamy, about 3 minutes; beat corn oil, bourbon whiskey, and vanilla extract into the eggs until just incorporated. Beat flour, white sugar, and light brown sugar into egg mixture until smoothly blended, then beat in butter. Gently stir pecans and chocolate chips into the filling. Fit the pie crust into a 9-inch pie dish and pour the filling into the crust. Bake in preheated oven until top is golden brown and a knife inserted halfway between the center and edge of the filling comes out clean, 55 to 60 minutes. Cool the pie on a wire rack for at least 15 minutes before serving. Serve warm or at room temperature. You may need to watch after 35 minutes of baking; check if crust edge is browning too quickly. If so, cover with aluminum foil and continue baking until filling is set as directed above. The recipe did not work for me. It says to add 1 and 1/8 CUPS of butter!! I have researched the recipe and others say to add 1/2 cup of butter. I have been making this pie for 10 years now. I usually brown the butter but I do not use oil. This is the staple of our Annual Kentucky Derby Party each year and it is always a huge hit!! Can I have another piece? Wow, delicious! This pie was wonderful! Being a Louisvillian, I've had lots of Derby pie and tried their receipes, but this one is the best by far. 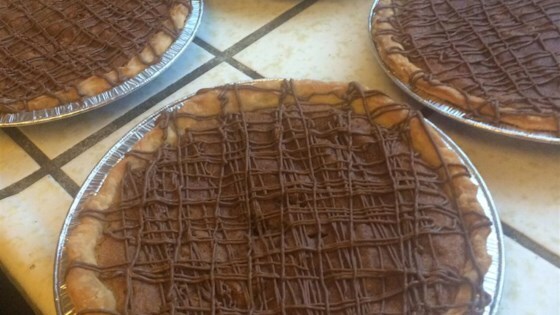 My husband LOVED this pie!!! And he doesn't like desserts, as a rule. A winner.